Forty six degrees for a high in early October reminds me that weather doesn't always adhere to the calendar as religiously as I do. The floors are cold when I get out of bed and begin making breakfast. The car is cold when I load the boys in even during the high-sun times of the autumn afternoons. My nose, toes and fingers are cold all.of.the.time.now. Add illnesses and the unfortunate loss of a loved family member to the mix during this blustery week, and it's no wonder even my heart was starting to feel the effects of this chill. I wasn't ready for winter in October. Luckily, I found something that warmed me today. Nothing like a little bit of love to do the job. I'm sorry to hear about a family death. 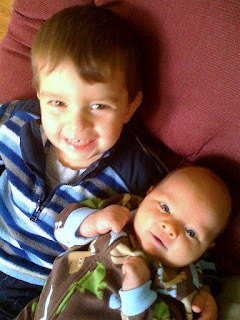 Good to know that you have those precious little boys to make you feel better.